Successfully Added NO.1 F2 Outdoor Bluetooth Watch - IP68, Altimeter, Thermometer, Pedometer, Stopwatch, App Support, Call Reminder (Black) to your Shopping Cart. To all sports lovers out there, Chinavasion introduces the NO.1 F2 Bluetooth smart watch. Being the ultimate outdoor gadget, this sports watch comes packed with an abundance of health and fitness features that support you during both everyday life and your upcoming exercise routines. Simply pair this Bluetooth watch with your smartphone, download the dedicated mobile application, and enjoy all its advanced fitness tracking and analysis tools to ultimate your workout performance. 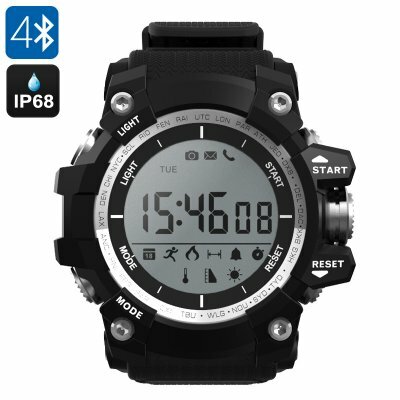 Featuring a durable IP68 rugged design, this Bluetooth sports watch is fully resistant to water, dust, and drops – allowing you to use it in the toughest of environments. Whether you use it in the gym, while mountain biking, or during an upcoming hike – this waterproof smart watch is guaranteed to meet all your health and fitness demands. Packing a high-end pedometer, this Bluetooth sports watch is capable of delivering highly precise exercise reports covering the duration of your workout, the distance covered, number of steps taken, and calories burned. With all this information at your disposal, you’ll be able to keep accurate track of your fitness developments while furthermore, it helps you to plan your upcoming workouts in the way that benefits you most. Besides its pedometer, this outdoor gadget also features an UV meter, thermometer, altimeter, stopwatch, and calendar function – making it a highly effective and multifunctional smart watch. When synchronized with your mobile phone, this outdoor gadget furthermore keeps you updated about the latest social media notifications, incoming calls, and messages – ensuring that you’ll never miss an important updated again. Packing a powerful 550mAh CR2450 button battery that lasts for up to 2 years, this Bluetooth sports watch allows you to head out on your next exercise without needing to worry about running out of juice. The watch furthermore features a sophisticated sleep monitor that makes sure you’ll get the well-deserved rest in between your demanding workout sessions – stimulating your muscle growth and recovery and ensuring that you’ll meet your upcoming goals in the fastest and most efficient manner.